Starting from version 6, the CyberSEO plugin allows you to generate comments automatically, using the user-created comment lists. First of all, you have to create the comma-delimited list of author names (nicks), insert it into the “Auto comments authors” box and save the changes. To fill out that list just google for “popular names” and “popular nicknames”. After assigning an unique campaign name, you need to fill out the “Comments” box. There you have to put your own pre-made comments (one comment per line). Try to make the comments relevant to the post categories (you need to specify them in the “Select post category” box) your auto comment campaign is targeting (don’t forget to spice them with your keywords). When the comment list is created, you may tell the plugin to shuffle and synonymize them using the global synonym table. 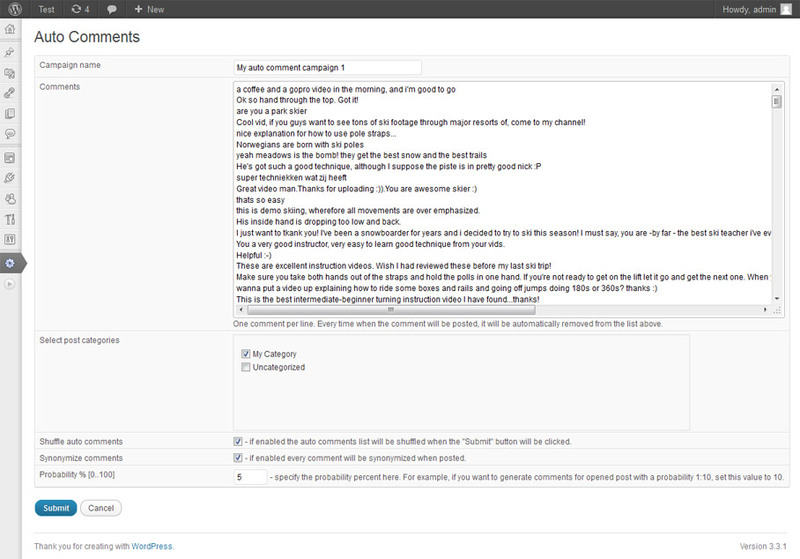 The auto comments module works in the following way. When someone opens your blog posts in the browser, the plugin checks if it meets the campaign requirements (i.e. if the post categories meet the campaign ones). Then according to the specified probability % (0 – never, 100 – always), CyberSEO makes a decision on posting the comment. In order to make sure that the same comment won’t be posted twice, it gets removed from the “Comments” list upon posting.